Database backup is a crucial part of business-level data security procedures. To take snapshots from every database existed, Handy Backup provides a couple of generic and dedicated tools allowing to backup database without any significant efforts or expenses. 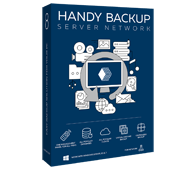 Handy Backup™ is a professional-grade software providing database backup and recovery for different DBMS types (see a list of supported databases). Along with databases, Handy Backup can save data of any other types, from files and folders to static website contents, CMS data and cloud accounts! This instrument takes snapshots of MySQL databases and tables, forming readable sets of SQL commands allowing restoring original MySQL datasets. The dedicated instrument can back up Microsoft SQL Server of any version (MSSQL 2016, 2014). This tool can save whole databases, tables, SPFILE and Controlfile. Handy Backup uses a dedicated instrument to back up PostgreSQL databases, tables and schemas, allowing backing up local or distributed PostgreSQL databases. The Oracle backup feature bases on a RMAN internal backup utility, providing a complete compatibility with an Oracle API. It can back up & restore Oracle data natively. The MariaDB backup feature allows users creating and restoring a sequence of MariaDB SQL operators, restoring a table backed up. Like MySQL, it supports many engines. The IBM DB2 backup plug-in is a solution allowing creating hot and cold DB2 snapshots, as well as restoring and replicating DB2 databases in a native API mode. The plug-in for backing up Lotus Notes/Domino files and tables allows quick and secure access to Lotus database information and effective restoration for taken snapshots. Sybase backup – saving a popular SAP database structures locally or on a server. Firebird Backup Database - safekeeping copies of different Firebird databases. FoxPro Backup - saving table content from the ever-popular desktop DBMS. To make use of the database backup plug-ins, you need the Small Server edition of our software. You can try small business server backup for 30 days for free! Cold backup requires you to stop your DBMS and let it dump all data from the memory to hard disk, after which you can back it up via usual file system copying. While this method results in server downtime, there are situations in which it can work exceptionally well. For example, if you have a Master-to-Slave replication configuration, then you can safely turn off the Slave, back up its files, and then start it again. Hot backup is a type of copying that is made through the use of database’s APIs. It is slower than cold backup, but doesn’t require stopping the DBMS server and allows making transaction-safe database snapshots while preserving business activities. Learn more about hot backup. All database backup plug-ins in Handy Backup are designed to retrieve data without interrupting database services, i.e. perform hot backup. The program can be used on both physical and virtual servers, and all operations can be scheduled to run daily or in your own period of time. Schedule backups, enable e-mail notifications – and always know that your data is protected. To learn more about our featured database backups, please see Automatic DB backup. Replication enables you to distribute the database across several servers and assign each server its own role, so that one server interacts with applications in a common way, while the others are used as read-only copies. Failure of one server doesn’t cause complete loss of service of your applications, and at any time you can reconfigure a Slave Server to act as a Master and vice versa. Note: Though replication configuration provides higher uptime and accessibility of your databases, it cannot replace backups. If your Master database accidentally crushes, all the changes will be automatically replicated to Slave databases. The same is true for clustering configuration where multiple servers (SQL nodes) act as one, without any specific roles. Clusters are usually based on distributed storage engines in which failure of any node doesn’t result in any loss of data. Unlike replication configuration, they do not allow for long-distance database distribution, but provide higher I/O speed and better response times. As a rule, it is always recommended to combine replication or clustering configuration and database backups. To back up databases, try Small Server or Server Network editions. Free trial! You can find pricing information on these and other editions in the Order section. In this video you can see an example of database backup made with the MySQL Backup plug-in. Note: To follow the instructions in the above video, you need to download our software. We are a very open company, and look forward to partnership opportunities with businesses from all fields of IT, including OEM, service providers, integrators, and other. Our solutions are already used by several web hosting providers who use it to back up databases of their clients. If you would like to join our partner network, or discuss details of potential co-operation, please refer to the Partners section. Enjoy one of the best software for database backup and recovery! I love this software. I recommend it to all my clients. Especially now that it has DVD burning which is great for most small business. I use it to back up inexpensive NAS's ... It keeps getting better! I liked the program because of its simplicity. Is there a warranty on the backup database,and how to check whether database backup was successful? You may always check the destination folder to see whether all the files are backed up or not (however this information is visible in the log file). You can also create a test DB and check if Handy Backup is fully functional and works properly.